Its the 4th of July and Farm Jeep is heading to the county fair! We’ve been invited to be a part of the antique machinery exhibit, and as the only farm jeep entry, we are sure to be a winner. We will show off our ribbon later. Thanks to those of you who have given us nice compliments and good suggestions for moving Farm Jeep forward. Over the next few months we will be incorporating those changes. We have, as recorded here in gruesome detailed, been chasing leaks and problems with the Newgren lift. The only possible remaining leaks had to be on top of the reservoir. That meant lowering the lift one more time. For future reference, we took notes and lots of photos of the disassembly process. We plan to post them at a later date. For now, we will simply summarize the process. Removing the lift or just lowering as in this case involves a few simple steps. You need to remove the PTO shaft and the rear gear box. Next you need to support the lift frame and remove the bolts at the front and all the bolts at the rear. Then lower the unit, with all the hoses still attached. The strange looking object pictured here is the jack we use to raise/lower the lift. 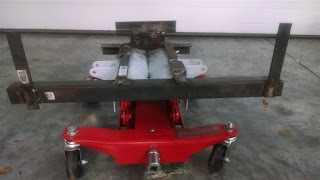 We took a Harbor Freight low lift transmission jack and added a “jig” made of scrap metal. While not pretty, it makes the raising/lower of the lift a one person job. With the lift lowered, we could reroute some of the hoses and remake connections with thread sealer made for hydraulic systems. The lift was then put back in place by raising the jack and replacing the bolts. But before we replaced the the PTO, we decided to test the lift. And the good news is. The lift worked perfectly! It lifted the 450lb plow with ease. No foaming or pressure build up in the reservoir. There is only one remaining problem – the lift starts to slowly drop once it is raised. It doesn’t matter if the pump is running or not. The bad news is that we believe we have damaged a seal in the cylinder. During some of our efforts to correct problems, we introduced excessive pressure on the seals. That means we will need to have the cylinder rebuilt in the “off season”. 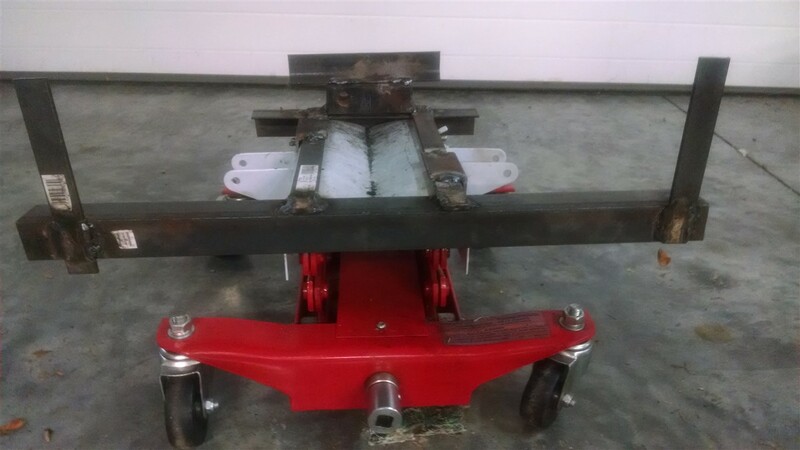 For now, we will simply place a piece of steel between the cylinder cap and the lift block to lock the lift in the up position when we need to transport the plow for any distance. Over the years, we have tried to learn as much as we can about hydraulic systems. Because the Newgren lift’s hydraulic system is different than modern systems, we questioned the engineering. What we have learned is that it is in fact a simple and even eloquent solution to a problem for single action cylinders. Single action cylinders require a port or breather hole to allow air to escape or enter as the piston is moved in and out. That port is normally open to the environment. With the cylinder on the farm jeep just inches from the ground, it is in an extremely dirty/dusty area. So how do you keep the port clean and open? You design a “closed system” by using and reusing the air in the top of the reservoir. So the mystery “bleeder hose” that runs from the bottom of the cylinder to the top of the reservoir is a simple means of getting clean air in/out of the cylinder. No dirt or dust can enter the cylinder. So we humbly apologize to those engineers at Newgren who designed this lift system. It was only our lack of a basic understanding of hydraulics that caused many of our problems. We finally get it and look forward to years of trouble free operation.